When I started my blog and writing about fashion/makeup/life my goal was to be able to share things I am really loving with people. This Saint Grace hoodie I just got is the epitome of why I started this…and is the very reason I am writing to you now. I am in love. This bad girl is EVERYTHING. I got it the first week of January and seriously…I may have gone two days this month NOT wearing it (and yes, I’ve washed it!). My sister and my mom wanted one as soon as they saw me wear it home and a few friends and strangers have asked about it too! 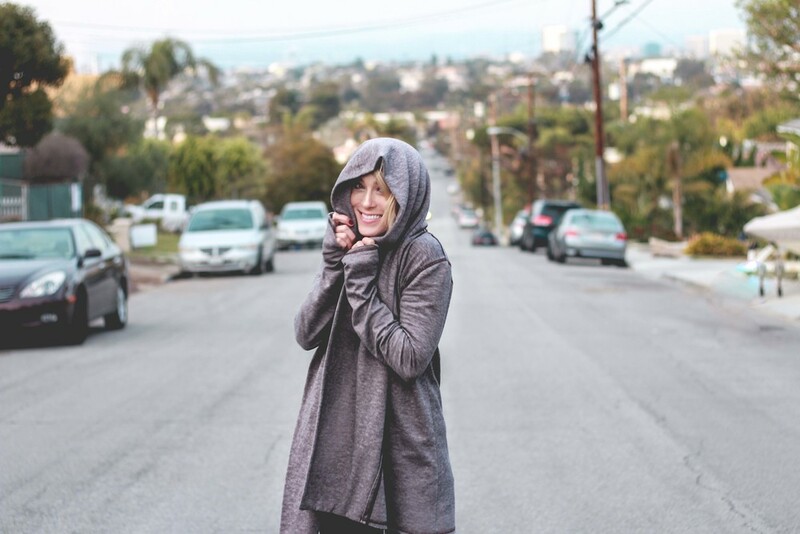 Perfect for a cold rainy day and long like a coat, but not too long, the hoodie easily pops up over your head for full coverage from a light rain! Obviously if it’s pouring you’ll def need an umbrella ‘cause though it has a hood, it is not waterproof! It’s easily dressed up or dressed down - I’m wearing it right now in my PJ pants typing this and earlier today I had it styled and semi-glammed up for this shoot! I paired it with my new favorite tank from Brandy Melville and my ride-or-die J.Crew Pixie pants and some new booties! Also a side note - some sites call it the ‘Leah Cardigan’ but don’t worry - it’s still the Fleece Hoodie! The Leah Cardigan on the actual Saint Grace website though is a different cut altogether, with no hoodie (you can tell by the bunching at the neck whether it’s the hoodie or not). In my opinion…you want the hoodie!